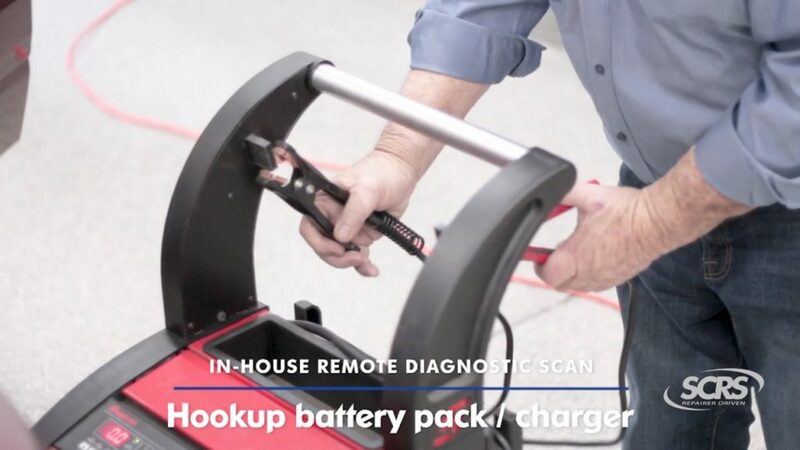 Having a remote diagnostics company conduct a scan through a piece of in-house technology can be more involved that it might seem to an insurer or customer, a new Society of Collision Repair Specialists video posted Monday demonstrates. SCRS Executive Director Aaron Schulenburg told the Collision Industry Conference before a special screening Thursday that members had told the organization they were having issues explaining scanning, particularly in-house work. “There’s a perception that maybe all it is is plugging something in, magic happens and it gets unplugged … that’s not quite the case,” Schulenburg told the CIC. A team including Schulenburg, SCRS Treasurer Amber Alley (Barsotti’s Body & Fender) and Education Committee Co-Chairman Toby Chess (Kent Automotive) traveled to SCRS Chairman Kye Yeung’s European Motor Car Works to produce a short educational video explaining the topic. Less than eight minutes, the film ought to be digestible to a layman as well as a repair professional. “It was really a learning experience,” Alley told the SCRS open board meeting Wednesday. She said the organization plans to do more videos like it. The video features a remote scan (e.g. AirPro or asTech) of a 2019 Ram 1500 Laramie short 4-door Crew Cab. “Each of the database providers recognize labor associated with pre- and post-scanning, resetting and clearing stored fault codes, testing, reprogramming and initialization of modules and diagnostic repairs as not-included operations,” Schulenburg narrates in the video. A Mitchell representative told the CIC the next day that there’s five different ways to scan a car, making a book time difficult to pin down. (None of the three information providers treat scans as an included operation.) The SCRS video makes a similar point. 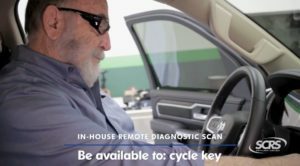 “The steps involved with performing a remote diagnostic scan, and in-house scan with an OEM scan tool and sublet scan to a dealer may all vary,” Schulenburg said. Finding the keys, vehicle and repair order. Moving the vehicle to a designated area. Obtain and hook up the battery pack or charger. Get the scan tool equipment. Hook up the scan equipment and cycle the key. Submit the scan report (which includes data entry of items like the vehicle and collision information, according to the video). Wait for the call from the scan company. Be present to follow additional instructions necessary to complete the operation, such as cycling the key, putting weight on a seat, moving a seat, tapping the brakes. Test-drive the vehicle in accordance with the scan tool company and OEM’s repair procedures. Such time can add up for the technician and the shop. Remember: Five little 0.1s are half an hour of shop overhead and half an hour a tech spent directly on that customer’s vehicle instead of performing another task. The steps to scan a vehicle might also have to be repeated multiple times, the video points out. It also observes that many of the items mentioned would be necessary in a post-repair scan too. A shop, insurer or customer also can’t expect that a scanning process started in-house will be completed completely in-house, according to the video. The scan might identify a task which could only be done by a dealer. work and still require sublet operations as well,” Schulenburg said. Schulenburg asked shops present at the open board meeting the video was something they would use in their businesses, if it had value. “Absolutely,” former SCRS board member Paul Val (Raintree Auto Body) called from the audience.